When we’re looking for live mussels in the riverbeds, we often find the weathered shells of deceased mussels. Opening the valves, a slurry of sediment and debris obscures your vision for a moment. Sometimes, though, we discover that these calcium carbonate skeletons have been claimed--by fish! It turns out that these shells make the perfect nesting site for fish (like darters) to lay their eggs. Last week, we visited the Sleepy Eye Creek, and were surprised to find lots and lots of shells nestled among the cobbles and boulders. Many more than usual were filled with little gelatinous-looking beads. After taking some pictures, we were sure to return the shells to the water as to not dry them out too much. A white heelsplitter shell from the Sleepy Eye Creek with fish eggs. 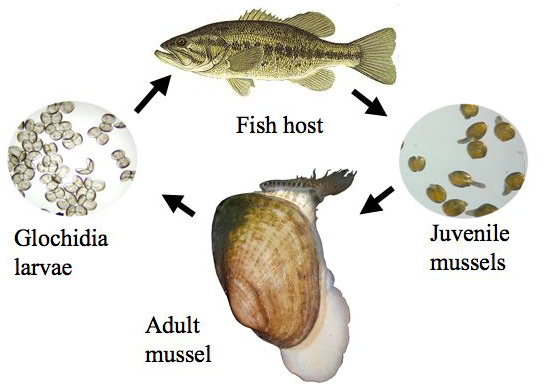 While the fish clearly utilize the mussel shells to reproduce, the relationship actually goes both ways. Mussels (of the living variety) often need fish to reproduce. Male mussels release sperm into the open water, and female mussels will produce eggs and hold them in their gills until sperm reaches them. Since mussels don't exactly have the means to move about far distances, some mussels use a special part of their mantle to entice fish to come try and take a nibble. Others release little packets, resembling food to the fish. Either way, instead of a meal, the fish are surprised with a mouthful of glochidia larvae, which attach to the fish's gills and hang out until they become juveniles. When they're ready, the juvenile mussels detach, having caught a ride to a new home!